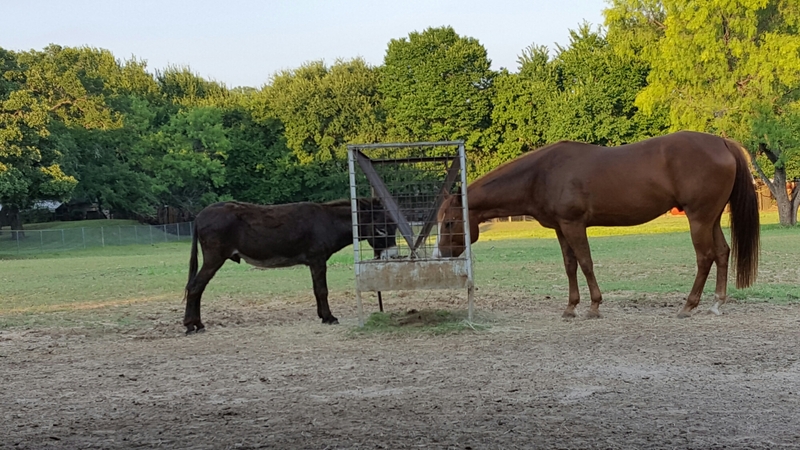 Here it is the second week in June in Texas and it is still cool enough to sit outside and enjoy my horse and donkey eat their dinner. Other friends such as bunny here and birds stop by for quick visits. Perfect evening to read and observe nature. I have loved horses since I was nine years old. It was like a switch came on. One day I was afraid of the them, the next I loved them. I did the usual reading and watching movies about horses and I took lessons. When I met a girl down the street from me, I had access to horses several times a week. Through her family, I learned about horse care and more about riding. I was introduced to horse showing and trail riding. After I moved away, horses were harder to be around. It wasn’t until after high school that I picked up a part time job caring for horses at a private boarding place. When I left that place, I leased my first horse. An American quarter horse by the barn name of Bear. Registered name of Sugar Flash Clark. A great grandson of Doc Bar on top and Sugar Bars on the bottom. He was a gentle bombproof horse. I wound up buying him and owned him for five wonderful years. When I had outgrown him and my goals had changed, I sold him to a wonderful woman who owned him for the rest of his life. Colic claimed him at age 28. An interesting story is the day that the woman who bought Bear called me about him was the same day I was going to look at my next and current horse. She fell in love with Bear and bought him. I fell in love with my next horse, but the current owner was out of town. When he returned four days later, I bought him and went to pick him up. The horse I bought was a three year old quarter horse. His barn name at the time was Webster. The owner had just gotten him registered. Late as far as papered horses go. His registered name is Argyles Sensation. I changed his barn name to Blaze. He is a grandson of Investment Asset through his dam. Through his sire he is a great grandson of Two Eyed Jack. I bought him as a show horse and have shown him only about a dozen times. I do trail ride with him but he is happier as a show horse. For years I kept him in a show barn, under lights and blanketed. Now he’s a pasture horse and loves it. He lives with two donkeys and one or two other horses. Loves not being cooped up in a stall up to 12 hours a day. On March 16th, he reached his 14th birthday. He is just as sweet and affectionate as he was at three. My love of horses had to transfer into my novel, so Mary became a horse trainer. The horses became supporting characters in their own right. Each horse in my life and my stories have distinct personalities and it shows. I loved how Ghostly Image, in JAM, made her story and voice be heard. She developed a tight bond with Mary. And even developed a bond with Jordan too. Ghost’s role in the story became bigger than I intended. Horses are big creatures and one would think they are strong, but they they surprisingly delicate. My quarter horse, Blaze had a swollen right hind leg this morning. I am not sure what he did exactly. Most likely, he banged it or got it caught. There are no cuts. The leg is swollen from the hock down. He is walking on it and bearing weight. 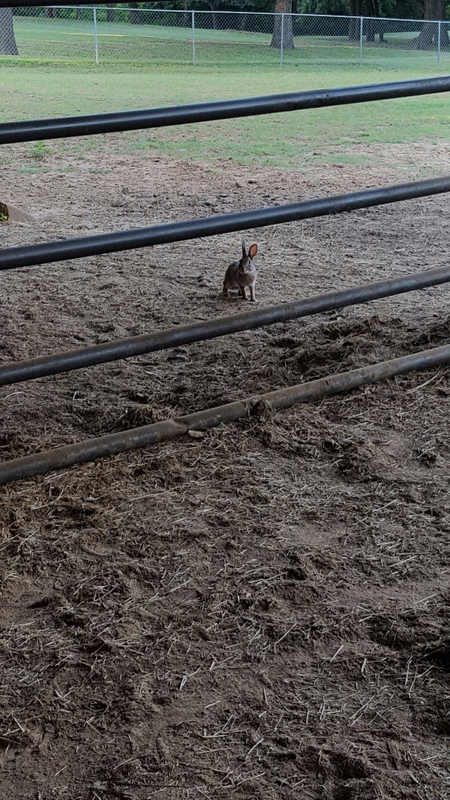 He even rested his left hind putting full weight on his right hind while I hydro-ed the leg. My first step was to access the damage. I found no cuts but could tell the right was swollen compared to the left hind. Then I watched him walk. No lameness. He was sound on it. If I had made him trot, I probably would’ve seen him favor it. Next I felt the leg. On the inside of the long bone, I felt heat. No a huge amount but definitely some heat. So I took him to the hose and applied water. Cold water can help reduce swelling. After running water on it for several minutes, came the tricky part. I needed to give Blaze bute. It’s an anti-inflammatory. It relieves pain and helps with swelling. Only Blaze hates eating it. Bute comes in three forms: Powder, paste and pill. I only have powder. Sprinkling it on his food won’t work. He eats around it. He also hates paste. So I did a combination. I took the powder, added it a large tube syringe and added water. After mixing it together, I was able to squirt it into his mouth after a bit of a struggle as he hates getting a tube in his mouth. I have the same battle when it comes to deworming him. It has been awhile since I have had to treat Blaze for injury. He’s a pretty low maintenance horse. I will monitor his leg and if it is not better by tomorrow, I will consult with my vet. Below is a full picture of Argyles Sensation aka Blaze and his hind legs while I hydro-ed it. It’ #TeaserTuesday! So here is a brand new JAM teaser courtesy of my friend and colleague Eryn LaPlant. Beautiful words spoken by #Jordan. So what did happen to #Mary? Pick up a copy of JAM today to find out. 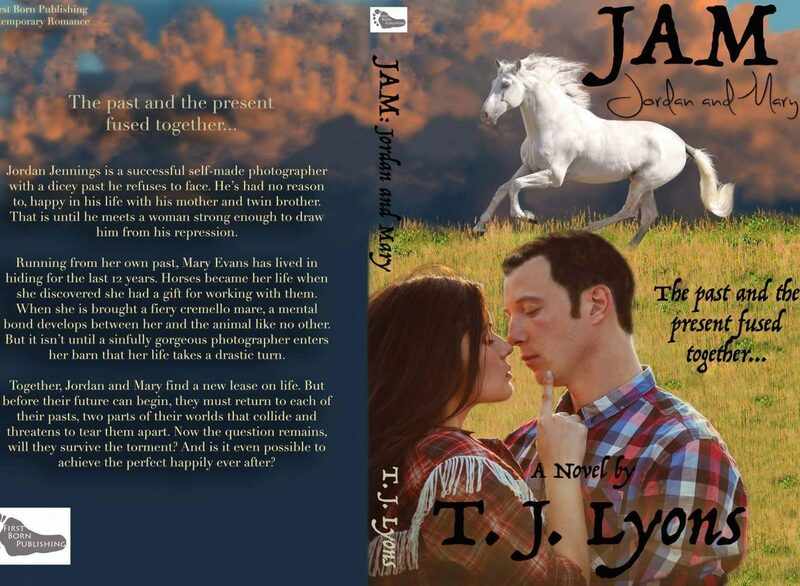 In JAM, the emotions between Mary and the horses are an important part of the story. I may have stretched what Mary can do regarding horses and emotions, but there is emotion in horses and all animals. Horses by nature are social animals. They live in groups and have a pecking order from the most dominant to the least dominant. Horses develop bonds of friendship just as people do. Some horses cannot get along with other horses and will defend their friends fiercely. When a herd member dies, the entire herd grieves. They will spend time with the body before moving on or the body is removed. I have witnessed this first hand. In the past year and a half, two horses I knew passed on due to colic and old age. When the first when died, it was late at night, so we had to wait until the next morning for the trailer to come pick up the remains for burial. All night, the other two horses and two donkeys kept vigil over the body. The horse, the deceased’s BFF even tried to stand on him and over him to get him up. A year later, that horse passed away. Even before he passed, my horse would stay close to him and sniff his belly and hind end. Whenever a horse is sick or not feeling well, my horse will stay close to keep them company. I believe horses can sense something that we cannot. They seemed to know and were trying in their own way to say goodbye. That was only a few months ago. Yesterday, the remaining two horses and both donkeys had their annual vaccations. After the donkeys had their shots, they wanted nothing to do with humans around them for the rest of the day. They were mad at us for making them go through that. The horses handled the shots better than the donkeys and had no anger towards us. My horse, Blaze needed to have his teeth filed down. Horses teeth continue to grow and domesticated horses need to have dental work done once a year to prevent their teeth from growing and making eating and wearing bits difficult. In order to do it safely, horses are sedated. Just enough to make them drowsy. So while writing JAM, I used these elements to develop the characters of Ghost and Sampson. Those two horses bonded with each other and Mary. Ghost bonded strongly with Mary and that bond is evident in the story. Today is the big day! JAM Jordan and Mary has been released. Jordan and Mary can’t wait to share their story with you! Jordan has already gotten comfortable and has started reading. Who wants to join him? I know I do! I would love to curl up with him and read any book. Here he is reading his story. And he is loving it! Look at that smile! Want to know who else is excited about JAM’s release? The horses. Yes, the horses in JAM can’t wait to tell their part of the story as well. Ghostly Image and Sampson are supporting characters in JAM. Read on to find out their part in the journey of this wonderful couple. Thank you to everyone you has supported me in this journey! Get your copy today! Enjoy the ride! Looking for your next book to read? Well, look no more! Tomorrow is the big day! JAM: Jordan and Mary will be released. Get ready for a story full of love and laughter, danger and excitement, fear and heartache! JAM has a bit of it all! Secrets refuse to remain buried. Bonds of love are tested. Horses prove they are loyal creatures. Jordan Jennings is a successful self-made photographer with a dicey past he refuses to face. He’s had no reason to, happy in his life with his mother and twin brother. That is until he meets a woman strong enough to draw him from his repression. Running from her own past, Mary Evans has lived in hiding for the last 12 years. Horses became her life when she discovered she had a gift for working with them. When she is brought a fiery cremello mare, a mental bond develops between her and the animal like no other. But it isn’t until a sinfully gorgeous photographer enters her barn that her life takes a drastic turn. Together, Jordan and Mary find a new lease on life. But before their future can begin, they must return to the each of their pasts, two parts of their worlds that collide and threatens to tear them apart. Now the question remains, will they survive the torment? And is it even possible to achieve the perfect happily ever after?